Ever since her days as a high school student in Flint, Michigan, Radhika Puttagunta has known she wanted to be a geneticist. After receiving her doctorate from the University of Wisconsin’s Madison campus, Puttagunta left the American Midwest to join her husband in Germany, and she now runs the Neurogeneration Laboratory at the Spinal Cord Injury Center within the UniversityHospital in Heidelberg. 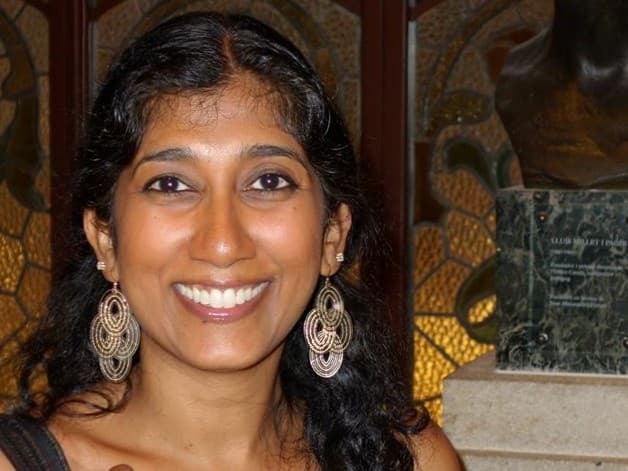 We caught up with Radhika, 41, a member of the Stuttgart chapter of Democrats Abroad, as she was working on two grant applications and hoping to carve out time to participate in the April 22nd Science March in Heidelberg. In an interview conducted via e-mail and telephone, Radhika took aim at the approach to science adopted by the new administration in Washington, D.C., described the challenges she faces as a woman in her male-dominated field in Germany, and talked about how she and her engineer husband manage two demanding careers and care for two young children. How did you become a member of Democrats Abroad? I was searching for groups for expatriate Americans when I first moved here about 10 years ago, and found Democrats Abroad, along with Writers in Stuttgart and the International Women’s Club, as well as a short-lived Book club. The first time I attended a meeting, however, was this year, as the group was undergoing internal changes. This was the first time I actually felt fear for my country and wanted to do something about it. I went to the February meeting because I believe that the country is headed sharply in the wrong direction. I was upset and so were several of my friends, whose anger registered with me via Facebook even from the other side of the world. I watched all this activism back home and wanted to be involved. I had been so elated in 2008 with the election of President Obama, and thought we had turned a corner as a country. But after that election I saw that extreme factions grew stronger, with racism and anti-government sentiment coming to the forefront, and biased cable news programs dominating the media landscape. I was shocked as I watched friends back in the USA struggle to afford health care for their families and the start of teaching non-scientific topics within science education in schools. I felt things spiraling downward, and then with the 2016 election, the bottom fell out. Betsy DeVos, a person without any public education background, who pushed “school choice” in Detroit, Michigan effectively destroying that educational system, was named head of the Education Department, and Scott Pruitt, who is vehemently opposed to environmental preservation, was put in charge of the Environmental Protection Agency, just to name a couple of the many disappointments in a very short period of time. What do you think of the new president’s approach to science? I think it will have the exact opposite effect of what he says he wants, funding on results alone is not the way to go forward. Creativity and solutions cannot be rushed. Things such as basic science research are being defunded, to give preference only to science that can be translated into human health benefits. Why is this problematic? Because where do we find answers to our current problems? Often in nature. Understanding how it works and what solutions have naturally evolved help us find new breakthroughs. When we start to lose that inherent curiosity about the world around us and are only concerned with results, we most likely will lose out on the really transformative discoveries. What has made American science amazing and had the world knocking at our door was the amount we spent on ALL kinds of science. I think the biggest innovations came from funding innovative risky out-of-the-box ideas or basic exploratory science without a specific result in mind. Those moments when you think there is no way this will work but let’s try it anyway -- those are usually the moments that go down in history. When you pull your purse strings so tight there is no margin for error, well, science just doesn’t work that way, it is a process. I am of the field of thought that we should fund more science and education, this is the way forward. Find alternatives for lacking resources, find cures for diseases we never lived through before, find new ways to conserve. Look at our history, how much has come out of funding science, we are able to achieve it, but we must fund it. We need knowledge, not war and slashing 20% of the NIH budget will not help with that. Unfortunately funding science after things are destroyed or epidemics are started does not help solve problems, we must remain ahead of the curve. How did you get to the job you do today and what does it involve? I have wanted to be a scientist since high school and I have wanted to be a professor since I was 16. The reason? I love science but more importantly, I want to teach others about science so that when they go off and vote, they make informed decisions on things that not only affect my work but our lives as a whole. I don’t want people to vote out of fear or ignorance. Classically trained as a geneticist, when I moved to Germany, I wanted to put my skills to work in the field of neuroscience. I find the brain and both nervous systems absolutely fascinating. There is no computer we have ever created or any invention that is even close to the human body. All of that is controlled by our nervous systems. Living in Stuttgart meant I had the choice between two well respected universities with excellent Neuroscience programs, Tuebingen or Heidelberg. After seven years of work at the University of Tuebingen, I have been running my own group at the University of Heidelberg for the past year. Although housed in a clinic, I do basic research, focusing on how to grow neurons again after a spinal cord injury. With that kind of injury, the damage means that the brain is no longer able to make a connection to the rest of the body – I like to say, the circuits are interrupted. I am doing research into how to regrow nerves, and re-establish the circuitry. We don’t just hope to make people overcome limb paralysis but regain bladder control, sexual function and overcome injury induced pain, issues often not highlighted in the field. I currently have three PhD students I am training, along with one post-doctoral fellow, a lab manager and several rotating masters students. I am now working toward the “habilitation” certificate necessary to become a professor in Germany. Aside from running my laboratory I teach courses for Masters and Phd students and hope to develop new courses for medical and undergraduate students. I love the creativity of what I do, that I shape young minds and I get to experiment! I get to actually think of possible solutions to problems and try them out. I can find out if I was right or wrong, how great is that?! Do you have family members who work in science? Not exactly scientists but my parents are both physicians, in fact most of my family on my mother’s side are physicians, but my father’s side is a bit more diverse. My late paternal aunt was a chemistry professor in India. One maternal uncle has a PhD in chemical engineering and runs the research division at the New York Blood bank after having been a professor at UC Berkley for many years. I have maternal cousins who also have become professors now after pursuing medical degrees, they are wonderful researchers at prestigious US universities. I have one paternal cousin who is pursuing his biology PhD. We also have our share of engineers, business entrepreneurs, lawyers, software programmers and such. Are there heroes whom you look up to? Yes, of course! First and foremost, my mother, as she was a pediatrician with her own practice (now deservedly retired). Being our primary caretaker, as my father was working quite a bit, she somehow she made it all work. She never missed an event at school, any doctor appointments or meetings. We grew up doing pretty much any activity you can think of, piano, karate, Bharatanatyam dance, Girl Scouts, guitar, basketball, tennis, horseback riding, etc. I am sure I missed some activities in there. Anyway, she was incredibly busy with us running around on top of running her own business. So when people ask me how I’m able to do something they view as extraordinary, I just don’t see it that way. I’m doing what I see as every day normal. I should also state that all four of my maternal aunts are just like my mother, doctors with families. As I said, it has always been my norm. That said I now know after haven been through it that it involves hard work and dedication; they are my heroes, especially my mother. I was so fortunate to have an amazing undergraduate advisor at the University of Michigan-Ann Arbor, who raised her two children while successfully building her research laboratory. She is German but now also an American citizen. She is an accomplished scientist, mother and choir member. Her talents are truly endless. Again, this showed me at a young age that you can have it all, you truly can be a mother and successful in your career. Do you participate in any networks for women in science? Are you helping to organize any events around the Science March? There aren’t that many for women at my level here in Germany, but I am involved in a mentorship program that is linked to a collaborative grant I am a part of. I did start a group in Tuebingen for female investigators after they finish their PhD and it has continued after my departure. Maybe one day I will get the chance to start a similar one in Heidelberg. Regarding the marches – unfortunately no organizing as I am really stretched for time right now. I must get two grants out by the end of the month, and for now everything else must wait. I hope to march in Heidelberg if I have the time. I was so disappointed to be out of the country at the time of the Women’s March and unable to participate. Have you encountered problems at work because of your gender? I have to say that in German culture, both men and women, are quite tough on full-time working mothers. It seems to be the belief that the mother should stay at home while the children are young. So I get shocked looks or comments to indicate such after I mention my full-time job and all the commuting I do. I have lots of female friends in the US who work and they don’t hear similar criticism for working full time with young children. You have to remember many of them grew up in daycares, after school programs or with babysitters and we didn’t find doing so to be detrimental in anyway. There are very few women here at my position or higher, so there aren’t many role models to turn to, and probably why I have inadvertently became a de facto role model to others. Do I feel women still have to work harder to prove themselves than men do in science? Yes. Does the data back me up? Yes. I still don’t see why me having two X Chromosomes would make me any less of a scientist or capable than someone with a X and Y Chromosome. Most of my colleagues are men, and although they may be more involved at home than previous generations most of them have full support through stay-at-home spouses. They don’t need to come home and worry about running the laundry so the kids have clean clothes for school in the morning. Is there an upside to all of this? Well, I am not sure how to explain it exactly but once you become a mother you find you become hyper focused and very efficient. I guess it is due to extreme necessity that may have been lacking before. Having a family in this field and being a woman even frames the smaller decisions. For example: I actually thought twice whether to put photos of my kids up at work. If a man does that, it’s, “Oh, how sweet.” But I might hear, “Such young children – that must be difficult for you to balance?” I could make life easier for me by hiding that part of my life but I don’t see any reason to apologize for my full life. So not only do I have their pictures up but also drawings they have done recently. I don’t dwell on the kids but I also do not ignore their existence. Biology is a field that starts out with about 50% women in PhD programs. By graduation you have already lost some of those women, in the post-doc years many more leave and very few stay after that. Those that do are typically not married, or if they are, they don’t have children. Those that do either of those two definitely don’t have multiple kids. Those of us that have opted for those three cardinal sins are considered to be a rare breed. Only time will tell if I can break through the glass ceiling, but I am not giving up. I want my kids to see that nothing can stand in your way when you want something. Not your gender, not your ethnicity and not your nationality. Do you consider yourself to be a feminist? Feminism means to me supporting women in their choices, careers and dreams just as much as we do men. I am not under the illusion that there will be complete equality as our biology does not for allow for it in some ways, but I do believe we can have intellectual and job equality. To do my part I actively speak about things I have experienced that I think women do not discuss freely enough about; dealing with infertility; not loving every moment of being a mother; raising a kid your way, and that way may be a mash-up of different cultures; choosing to breastfeed or not; marriage is hard work; speaking your mind and feeling that you deserve to be heard; knowing yourself truly and your own desires before getting involved with someone else; being abundantly clear with your significant other, they are not able to read your mind; that quality is better than quantity of time with kids; making sure to look after your own health because too often we let our health slide to unhealthy depths; and that not everyone needs to marry or have kids and that is perfectly ok. As you can imagine the list goes on and I think we benefit from having more open discussions without fear of judgement but support of our sisters. Have you had to deal with failures or major obstacles, and if so, what did you do to get past them? Unfortunately, I had a very verbally abusive PhD advisor. He was pretty horrible. Whatever his reasons were he took out his life frustrations on me. I nearly dropped out of graduate school because I thought he was right when he told me I was stupid and lazy, because the experiments didn’t work the way he wanted. It took all I had in me to pick myself off the floor literally and crawl my way back to graduation. I asked for help and no one was willing to help, probably because he was careful to keep the abuse hidden. What it taught me was resilience, to keep asking for help, that failure is OK, and learning from it is crucial, but most importantly, to never, ever, let someone have that type of control over me again. I now feel that if I could make it through that I can make it through just about anything. What might a friend or family member say when asked to describe a characteristic or experience that would define you? I have never been “normal”. It may have been from being a first generation American and bridging two cultures, maybe it is from being a woman in a male dominated field, maybe it is being a minority, or just a combination of all of them. I have never felt that I fit in any box, but I am OK with that, I am uniquely me and I like that. Strangely I always felt that was what being American was about, and I am seeing nowadays that I may have been mistaken. What is this “free time” you speak of? No, seriously I used to have many hobbies but life got busy with kids, working full time and commuting previously 1.5 hours daily to now 3 hours daily. I used to play tennis, read, choreograph bellydance and write poetry. I hope to get back there one day. I teach my students that creativity outside of the lab breeds creativity in the lab, I really do believe that. Where do you find inspiration, or cause for hope? In nature and medicine. Look at all that is around us, how amazing is it? I get to study that. Look at the human body, can you think of anything more complicated and intricate, yet more beautiful or functional? I can’t. Look at all the strides we have made so far in medicine. Those strides come from scientists like myself tolling away behind the scenes, rarely getting any credit. Why do we do it? Simply because we couldn’t imagine doing anything else. I may not like every aspect of my job, but for the most part I have my dream job. How did you and your family end up in Germany? My husband is German. We met while he was studying abroad at the University of Wisconsin-Madison. The agreement was that whoever graduated first would move to the other person’s country, and then whoever moved got to make the decision on where to live next when the other one graduated. Needless to say, I graduated first and I decided we would remain in Germany. I decided raising a family the way I want to would be easier in Germany. While we may not make more money here, we have more services easily accessible to us, such as reasonably affordable healthcare and childcare, greater personal safety due to less gun violence, strong funding of science, paid parental family leave and better work-life balance, decent roads (take a trip to Michigan and you’ll see why that is on the list), and strong free public education through university level, so I can actually save for retirement. Oh, I also like that it is quite easy enough to pop over to another country to experience their culture, and that you get enough vacation time to do so. That is just so crazy to me, even though I been here for 10 years now. How old are your children, and are they in German schools? My son is seven and my daughter turns four soon. My son is in first grade at a German elementary school, my daughter is in a full-time pre-school. Both have gone to child-care or pre-school programs since they were nine months old, mostly full time. I worked part-time after a year off following the birth of my son, only because I couldn’t find full-time daycare. After having my daughter and taking a year off, I returned to work full time. Have you taken them to your workplaces? Yes, they have been to my labs. I talk about science with them. It is really important that you talk about what you do with everyone. My feeling is, if I can’t explain what I do to everyone, including children, then I’m not all that good at what I do. How do you and he work out the balance in your careers and family life​? Lots of people have asked me how this works. My husband knows how cut-throat it is in academia, and how much I want to be in it, and have wanted it my whole adult life. Since I got the position in Heidelberg and commute so much, about 3 hours a day, he has stepped up even more and cut his hours back at work. This was his choice and I love that he supports me and our family. He is now the primary caretaker, meaning he drops them off and picks them up, he does the grocery shopping and cooking (he is quite talented in the kitchen and has always had this role in our relationship), he deals with bills and taxes, he does the doctor appointments and parent evenings. What do I do? I do the most I can in the time I have. I make time in the morning and evening for the kids and also the weekends. All of the rest of the household duties fall to me. I am lucky my husband knew himself well enough to know whom he wanted to spend the rest of his life with. He really listened to me when I said science was a big part of who I am and having a family did not mean giving that up. My husband and I may be as different as day and night but maybe that is why we work, we complement each other well, my strengths are his weaknesses and vice-versa. Besides my husband, our full-day pre-school and full-day school, I must give credit to my in-laws. Without them we wouldn’t be able to do what we do. I always said I would live either near my parents or his. I grew up on the other side of the world from my grandparents and I didn’t want that for my kids. Not only do the grandparents spend a lot of time with our kids, but they bail us out whenever we need help. They do it willingly, they love their grandkids and seeing that makes my heart swell. I have been blessed many times over. When I am speaking and say home I could be referring to Germany or the US, it depends on the context. However, it is funny you ask this, it was part of my wedding vows. When you are first-generation American and you look like me many “Americans” don’t think I belong. So I am not considered really American by Americans and not really Indian by Indians. I AM American and only lived in the US until moving to Germany. We did three-and-a-half years across an ocean long-distance, including one-and-a-half years after getting married. Anyway, my wedding vows said that I never quite felt like I belonged anywhere truly until I met my husband and home is where he is. That is how I feel, where we are together is home, the place doesn’t matter, the person you spend your life with does. I am completely a Midwest girl, born and raised – born in Park Ridge, Il. (Chicago adjacent, where Hillary Clinton grew up). My parents immigrated from the state of Andhra Pradesh in India, and had lived with the fighting in Ireland before moving to Chicago. From there we went to Detroit and then on to Flint, Michigan. I know people have heard about Flint in the news recently, but it was really a great city to grow up in back in the day. People don’t realize it was very affluent – previously known as BuickCity, home to the General Motors Institute (now KetteringCollege), a very good engineering college. The old downtown was paved with cobble stones, there was the Flint Institute of Art, the opera, the ballet, MottCollege and AutoWorld. There was a lot going on in Flint, but then when Buick moved out, there wasn’t much diversification, and things went downhill. I was shaped by growing up in southeastern Michigan, and I thought everywhere was as diverse as that. We had lots of African-Americans, Indian-Americans, the Arab population was the third largest outside of the Arab world, there was a sizable Latino population. It was like that when I went to college at the University of Michigan in Ann Arbor. When I went to graduate school at the University of Wisconsin’s Madison campus, I was in for a bit of a shock. 9-11 happened while I was there, and you could start to feel the tension. When I ventured out of southern Wisconsin I realized the state was relatively homogenous and I wasn’t always welcome there. It is hard to put into words. Somehow the US was different when I was growing up, there was racism but maybe it was more hidden and now it is more in your face. Priorities seemed to have changed. People used to be more open and helpful, now they just seem frightened and it isn’t always clear of what. What do you hope to be able to look back on later in life? I hope when I look back that I will see that I raised two strong independent thinking children, married the man I love and respect, I was able to add to the knowledge base out there in my field and move it forward. I hope to train some students that will continue as good academic scientists as well as others who will branch out into other fields. All in all, I hope that my existence makes a difference.